In order to foster habitat conservation, watershed integrity, education and the enduring connection of people to the natural world, we acquire and provide access to lands along the Windmill Hill Ridgeline and nearby areas. 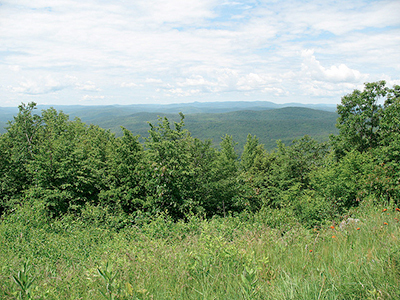 The long-term vision of the Windmill Hill Pinnacle Association is to have an interconnected network of natural and wilderness areas collectively stewarded by multiple conservation organizations connecting people to the land through education and recreation and which is sustainably balanced with the preservation of natural and wild habitat. In order to further the mission and long-term vision of the Windmill Hill Pinnacle Association, we have established the following Initiatives, Goals, and Action Steps for the next five years. This Strategic Plan will be implemented under the leadership of relevant committees and evaluated by the benchmarks listed. Research and acquire lands as deemed priority by board and/or sister organizations. 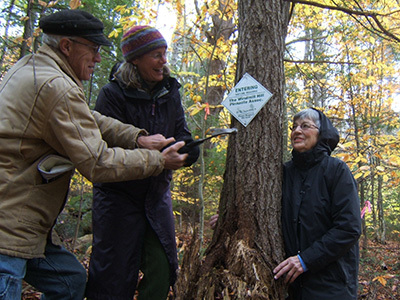 Volunteers keep Pinnacle’s 20 miles of trails safe and inviting for hikers. Here Roger Haydock demonstrates how to improve side-hill drainage. Observing left to right are Molly Wilson, Oliver Brody, and Rick Cowan. Student Outdoor Education. For a number of years the Pinnacle Association has worked with the Westminster schools to provide a nature-study program for all third and fourth graders. Beginning in the spring of 2013 a naturalist from The Nature Museum at Grafton has worked with the Association and the third- and fourth-grade teachers to implement the project whereby all classes in the two grades visit Pinnacle lands multiple times each year. The naturalist, classroom teachers, and participating parents accompany the students. Everyone generally climbs to the summit – stopping for observation and discussion along the way – and picnics at the top. 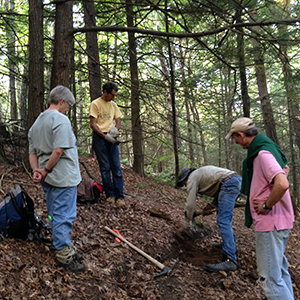 Specific study topics are determined by the standard school curriculum and have included ecosystems, Vermont local history, weather, erosion, and mapping. All students draw from nature, record their observations, and keep a journal documenting their investigation.